Always we like to watch online videos on the sites like YouTube, Dailymotion, NetFlix but sometimes due to the internet issue we download them for offline viewing. Usually we get the FLV format video after downloading because mostly all sites play the videos in the FLV format and users get the same video format after downloading. Now the problem is that we can’t play these format videos on mobile or computer. In that case we need to convert FLV to 3GP or other formats which are compatible with our current operating system. This article is based on this issue and you can get to know how to convert FLV to 3GP quickly. 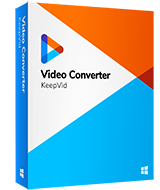 If you are looking for a best video converter program to convert your files then KeepVid Video Converter is an extremely powerful audio and video file converter program. Including conversion of FLV to 3GP format it also converts your audio and video in WMV, AVI, MP4 and many other formats. This wonderful software is fully feature complete video tool has many features related to video and audio such as conversion, downloading and editing. Convert the audio and video in the 1000+ formats which is the best supported format number. Download the videos over 10000+ sites including YouTube, hulu, Netflix and all other major video sites. Supports video conversion in the HD formats to get the best quality videos. Instead of going for one by one conversion you can convert the files in batch with KeepVid Video Converter. You can trim, crop, rotate, add watermarks, add subtitles to the videos with this FLV to 3GP converter. Step 2. Select MOV as an output, and click the Convert button to start converting FLV to 3GP. To convert FLV to 3GP download the windows or Mac version on your system and launch it. Now click on “Add Files” option and browse the system drives for FLV files. You can also add files to the FLV to 3GP convert using drag and drop. Move to the next step and select the target format. Loot at the top right side and click the dropdown button then select 3GP as the output format. At the bottom right side of interface click “Convert All” button and begin video conversion from FLV to 3GP format. •	3GP format is mostly supported by the Symbian mobile devices only so instead of converting video to 3GP go for the MP4 because this is widely supported format by mostly all media players and OS. •	This above FLV to 3GP converter has different profiles of 3GP format. If you need the quality same as the original video then choose same as source while choosing output format. 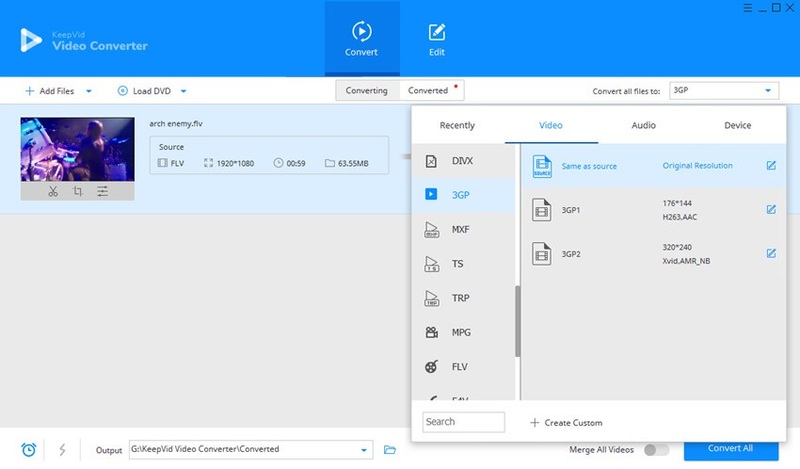 •	If you have multiple videos in FLV format and looking a single file then simply add all videos together and choose “Merge All Videos” at the bottom of convert tab. All videos will be merged together automatically after conversion. • Converting 3GP to FLV is also an easy job to do with KeepVid Video Converter, and it'll finish the task within short time. KeepVid Online Video Converter is a free online video converter web application that can convert your all videos in the MP3, 3GP, FLV and many other formats. This FLV to 3GP converter online application supports high quality video conversion. This is a very lightweight but powerful converter website which is very user friendly, easy to use and convert videos without any size limitation and no registration required to convert files with this website. Apowersoft free online converter is also a free video converter web application that enables you to convert video and audio in different formats online without any installation. This website also doesn’t needs you to register any account for conversion of your files. There is an additional feature provided on this website which allows you to download videos from the online sites as well. 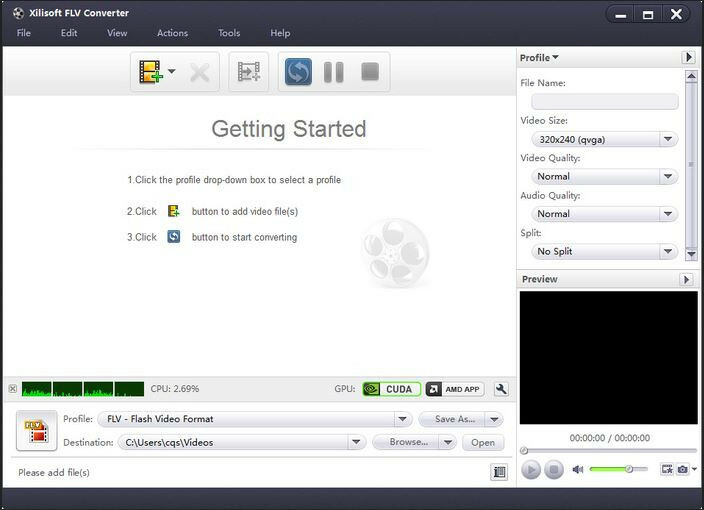 Clone2Go Free Video Converter is free converter software available for windows operating system users. This converter software has really a very nice program interface which is very easy to understand by everyone. This is not totally free video converter it always ask you to get the paid version after every conversion that is really annoying. Convert FLV to AVI, mpeg, DivX, MOV and many other popular formats. It can automatically detect the system configuration and increase the conversion speed of your FLV files. You can convert the audio and video in batch to save your time. Any Video Converter is free video converter software available there for the windows users. This software is an all in one solution for all your videos related problems. You can effortlessly convert video, audio in any format in the good converting speed and video quality. Support conversion of files for the different devices such as Android, iPod, iPad or iPhone. Very friendly interface helps people to understand program options quickly. Batch conversion of video and audio file formats. Supports the downloading of videos from few video sharing sites.